Home / Opinions / Why is the European dream fading? Why is the European dream fading? During the last two years, more and more EU citizens have turned their back on the European integration and returned to nationalistic and populist ideas. Is the European dream fading? For more than half a century the European Union was admired as an example of successful integration of various nations. In 2004 Jeremy Rifkin published his book “The European Dream: How Europe’s Vision of the Future Is Quietly Eclipsing the American Dream”, where he discussed the birth of a new strong uniting idea – European integration. The scholar highlighted the strength of European unity, economic success, social welfare and ‘soft power’. He presented a number of inspiring facts, such as the bigger percentage of people feeling themselves citizens of the EU rather than of their own country. Reading the book, it can be easily noticed, that it was written before 2008 economic crisis, which made many Europeans to disappoint in the European project. The last two years made even more citizens of the EU to turn their back onthe integration and even return to nationalistic and populist ideas of the last century. Is the European dream fading? What happened in the last 10 years that shifted the European project far back? The crisis of the Eurozone divided deeply Northern creditors (Germany) and Southern debtors (specially Greece). Misunderstanding in doing business reveals crucial cultural differences, that were not taken into account while integrating Europeans. The unsuccessful Western involvement in Middle Eastern conflicts made hundreds of thousands of migrants to search for a better life outside their homelands and to flee to Europe. Due to its wealth and its belief in the protection of human right, the European Union felt obliged to accept illiterate people without papers. As for migrants, since the next moves were not clearly defined, their integration into the European became a source of problems. the EU’s idea of human rights were hit by ISIS because, along with refugees, the Union welcomed terrorists on its territory. When Russia invaded a part of Ukraine’s territory – a sovereign European country – the EU has lost its credibility in terms of ‘soft power’. Eastern European countries that fear a potential Russian aggression had to rely mostly on NATO and US military forces. European ‘soft power’ did not reach any success in making Russia to comply with its international obligations. Meanwhile, after the UK citizens voted to leave the European Union in June, some other countries also took into the consideration this option for themselves. Far right nationalistic movements, with the help of Russian money, appeal to biggest fears of whoever is unknown and foreigner. The spread of fascist xenophobic ideas within all countries of the European Union is unprecedented. On the one hand, the younger generations do not remember those times before the Union and cannot hence appreciate all its achievements. For this reason, it is unsatisfied with the EU regulations. On the other, the older generations – especially in the new member states – cannot accept all the innovations and freedoms of the new EU construction, such as sexual rights, intercultural exchanges, transnational corporations. They want to preserve their culture by slowing down globalisation and internationalisation. 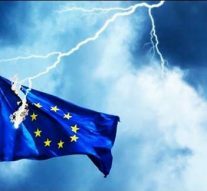 The gigantic bureaucracy and the so-called ‘democratic deficit’ are other problems of the European Union. Except electing the European deputies, European countries do not see how they can leverage the Union’s decisions. Thousands of EU’s officials produce laws that regulate the size of cucumbers, but cannot guarantee people’s security from external threats. The Brexit referendum showed that many people did not analyse their decision before the actual vote. Trends on google search showed how a massive increase of question “What is the EU” and “What is Brexit” occurred in Britain exactly after the outcome of the referendum. We cannot blame people for thinking after they casted their vote, but we should rather analyse the EU’s mistake. A lot of EU’s citizens are not really aware of what the Union actually is, what its achievements are, where their taxes go and why it is important to stay inside. The lack of the EU’s education is a serious issue. After the Brexit Referendum, some of the European officials have already understood that the Union should change. According to Guy Verhofstadt, President of the Alliance of Liberals & Democrats for Europe in the European Parliament, people are not against the European Union per se but rather the current European Union. At his latest speech in the European Parliament, he showed data from a survey, proving that European people want more EU actions to fight against terrorism, to better regulate migration, to promote new jobs, to create a European army to defend the Union’s borders. Supported financially and advisedly by Russia, populist nationalistic parties play with people’s emotions by using strong arguments in topics such as migration, economic and belief crises in the EU and offer them something new, although not exactly defined. The outcomes of the Dutch and British referendums showed not only people’s dissatisfaction in the Union, but also revealed the issues of weaker pro-EU campaigns. The European politicians might think that the EU’s advantages are patently obvious, but for ordinary Europeans they are not. These people gave their vote to simple explanations of nationalistic parties, that understand their fears and doubts. If the EU is to bring back to life the European dream, it should communicate with its citizens. It must do what they require and explain every of step it makes, every need it might have. Moreover, it should make clear the advantages for every individual. Furthermore, the European Union should equip itself to face the contemporary world situation and become effective and transparent. If not, the European citizens would choose the path of dissolution and no one knows what will follow then. « Previous Article 2016 Consumer Markets Scoreboard: Are EU markets working well?